Our team is committed to providing you with a holiday of a lifetime. Please contact us to arrange an inspirational and personalised itinerary. We believe every holiday is unique and precious, as people come together to create lasting and special memories of shared experiences. ​​Please note that these trips can be extended ​to discover more of Uganda if you have time . ​​​​​ We can also tailor make your trip depending on your interest. After breakfast, we shall transfer to Lake Mburo National Park. 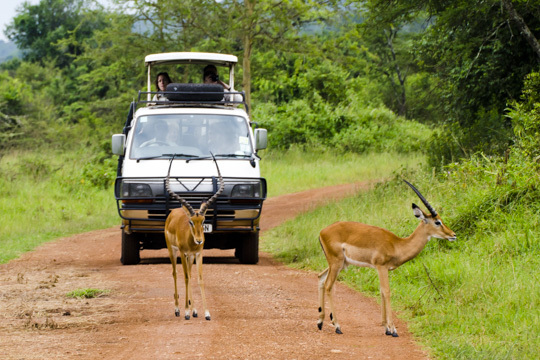 You will do a game drive and later relax at the hotel and enjoy the beautiful scenery of the park. Overnight at Eagle's Nest camp or Mantana safari camp. Day five - Walking safari - Transfer to Kampala and departure. In the morning you have breakfast and go for a guided walking trip. Here you will be able to see Zebras, Giraffe, buffalos, elephants, eland, Kobs, and other wide varieties of wild animals. After the game drive, you will be transferred to Kampala for departure in the evening. Day One - Arrive in Uganda – collection from the airport and transfer to the hotel. On arrival at the airport, you will be picked up by the AJ tour team and transferred to the hotel for overnight. If you arrive during the day, we can visit the Uganda Wildlife Education centre, the botanical gardens and Kampala city centre. Overnight is foreseen at Airport Guest House or Serena Lake Victoria Hotel. Day two – Transfer to Bwindi – This is a 7 to 9 hour drive through Ishasha with stop-overs for lunch and photo opportunities. Arrival is foreseen in the evening. Overnight at Buhoma community camp or Silverback lodge. Day three - After your breakfast at 7.30 am you will be met by your AJ Tour's Driver & Guide and report for the Gorilla trek and briefing (packed lunch included). After the briefing, gorilla tracking starts by 8:00am at the latest. Tracking can last a maximum of 6 hrs. In the evening, you will go for the village walk to see the ways of living of local people around Bwindi. Overnight at Buhoma community camp or Silverback Lodge. If anyone does not take the gorilla trek, we can propose optional activities such as village walks around Bwindi, visits to community projects, schools , the hospital and state of the Art Nursing School. Gorilla tracking location can change depending on the availability of gorilla permits at the time of booking. Gorilla permits should be booked at-least 6 months in advance. Day One – Arrive in Uganda –Collection from the airport and transfer to the hotel. Day three - After your breakfast at 7.30 am you will be met by your AJ Tours Driver & Guide and report for the Gorilla trek and briefing (packed lunch included). Day Four –Transfer to Queen Elizabeth National park through Ishasha. At 7.00 am, you will be met by your AJ Tour's Driver & Guide and go to Ishasha and do a game drive before continuing to the northern part of the park. You will go searching for the famous tree climbing lions. Among other animals to see include Uganda Kobs, Elephants, Buffalos, warthogs, bushbuck, buffalos and others. You will return for lunch and head to Euphorbia lodge. Day Five – After 6 am coffee/tea wake up call, start your early morning game drive. A packed Picnic breakfast will be provided. Travel to Mweya side for the boat cruise. Report for Kazinga Channel boat trip at 14.00. After the boat trip return to Euphorbia lodge with game drive on route. Overnight: Euphorbia lodge or Mweya safari lodge - full board. Day Six- Transfer to Kampala and Departure. We shall do an early game drive as we drive from the hotel for a transfer to Kampala (we assume your flight is in the evening). Arrival in Kampala and Entebbe is foreseen at 6pm. Take a shower and transfer to the airport for departure. Day 3: Bwindi Forest – Kampala. After breakfast, drive back to Kampala with a stop en route for lunch as well as stopping to take photos at the Equator, shop for curios and have an informative talk before proceeding to Kampala. 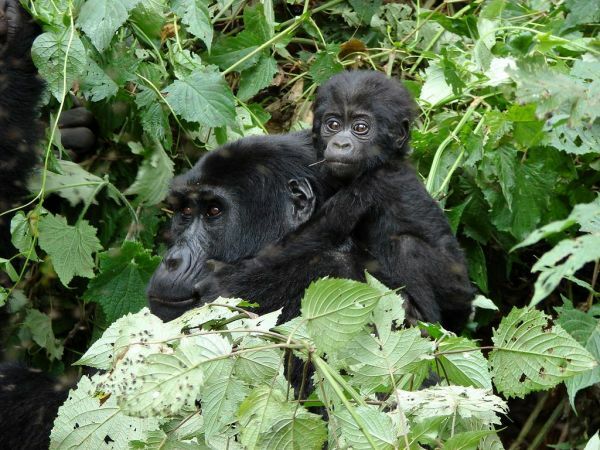 This trip invites you to come and see the world's remaining mountain gorillas in the wilds of Bwindi Impenetrable Forest, the best park for tracking the endangered mountain gorillas. This Mountain gorilla trip starts from Kampala, the capital of Uganda. 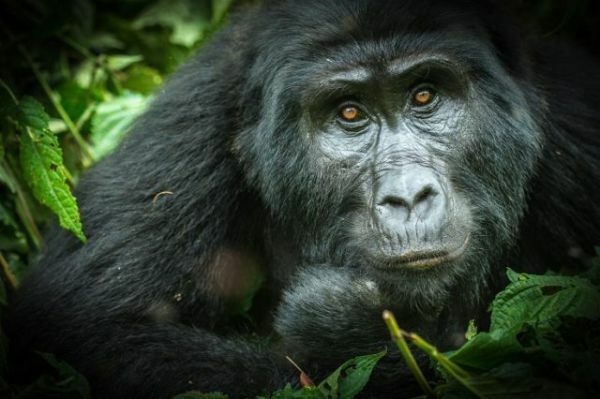 Have one of the most rare poignant wildlife adventure experiences of looking deep into the expressive brown eyes of these gentle giants on this tour in Uganda. This is a long whole day drive from Kampala through Mbarara and Queen Elizabeth National park: On the way you will pass the equator line for photo taking, markets and other fascinating scenaries. Overnight is foreseen in Bwindi at Gorilla Forest Camp/Silverback lodge/Buhoma Community Bandas. Murchison falls + Queen Elizabeth NP safari. Day 04: Kasese, NP Queen Elizabeth, Edward Lake, Kazinga channel boat cruise – o/n Euphorbia Lodge or Mweya safari lodge. After breakfast, we shall continue our journey to Queen Elizabeth NP with a visit to the crater lakes and the equator for photo opportunity. In the evening you will go for the boat cruise on the Kazinga channel. The Kazinga Channel is a natural channel of 36 km long between Lake George and Lake Edward. 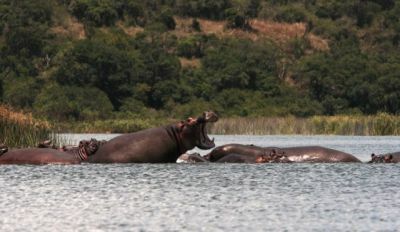 You will be able to see elephants, hippo, Nile crocodile and many water birds. The water birds are plentiful along the channel: African skimmers, African fish eagles, cormorants, saddle-billed storks, pelicans, etc. The Kazinga Channel divides Queen Elizabeth in a northern (Mweya) and southern part (Maramagambo, Kyambura, and Ishasha). Accommodation: Euphorbia Lodge or Mweya safari lodge. Day 05: Early morning game drive - transfer to Kampala – relax in the evening on lake Victoria and later departure to the airport. After breakfast, we shall transfer to Kampala, reach in the evening hours. You will relax at the lake Victoria - shower and departure. On arrival at Entebbe airport, you will be picked up by our team and transferred to the Murchison falls. 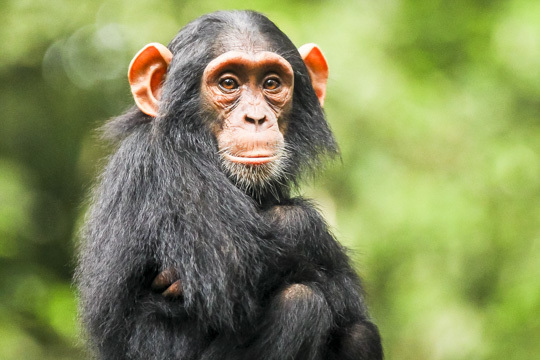 On the way to Murchison falls, you will go for chimpanzee tracking in Bugondo forest and later continue to the red chilli. Arrival is foreseen in the evening. Dinner and overnight at Red chilli camp or Parra safari lodge. 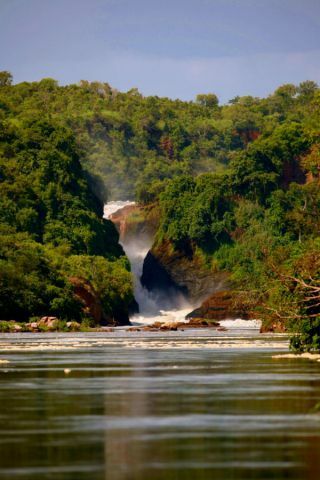 Day 02: Murchison falls, safari between Lake Albert add Victoria, boat trip on river Nile – o/n Red Chilli camp. You will cross the ferry to go for a morning game drive through the delta circuit, reputably known for high concentrations of wildlife. 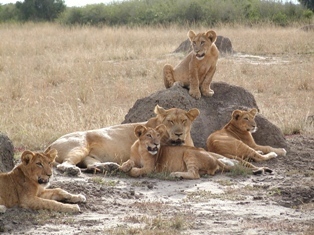 What to expect; Lions, leopards, elephants, giraffes, buffaloes, hyenas, hartebeests, Oribis, Uganda Kobs, birds and monkeys. In the afternoon, you will go for the launch cruise on the Nile. In addition to taking you close to the base of the waterfall, the 3 hour launch trip follows a stretch of the Nile with a compelling African atmosphere. Game viewing is excellent, spending the rest of the day at leisure. Overnight at Red Chilli Camp or Parra safari lodge. Day 03: Transfer to Fort Portal through Bugungu Wildlife, Fort Portal – o/n Mountains of moon hotel. After breakfast, you will transfer to Fort Portal via Butiaba landing site, hoima, Masindi and arrive in the evening. Overnight is foreseen at Mountains of moon hotel. Collection from Hotel at 7.30 am - transfer to Jetty on bank of Lake Victoria at Entebbe Wildlife education centre to take boat trip to Ngamba Island Chimpanzee sanctuary for guided visit. On return optional visit to Entebbe Wildlife education centre before transfer to Entebbe Airport. Departure time: 8am and return at 3pm, Second session leaves at 10:30am and returns at 5:00pm. Boat and car transfers, entrance fee on the island, viewing of the chimpanzee feeding and lunch! You will view either a morning or afternoon feeding of the chimpanzees from the visitors platform area along the edge of the sanctuary fence, hear an informative talk by sanctuary staff, enjoy lunch, viewing a neighbouring fishing village, bird watching, other wildlife encounters, or just sun bathe and relax.Life jackets and rain suits are provided on board all boats.